It's a bright, compact LED scanner with a crisp, 3-sided prism which duplicates the beam for great effects and a larger coverage area. 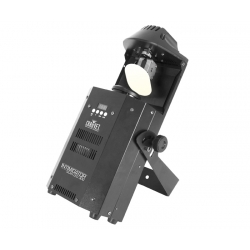 Its high-frequency LED dimming allows for flicker-free video operation and it's packed with tons of features to enhance any show. 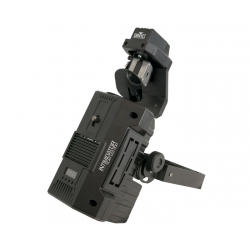 It features a motorized focus for crisp gobos, sound-activated programs, and built-in automated programs for a synchronized show in master/slave mode. Plus, you can power link up to 4 units and save some time running cables and extension cords. It’s a bright, compact LED scanner with tons of features, like built-in movement macros and move-in-black features, silent electronic dimming and strobe features, awesome sound-activated programs and easy access to built-in automated programs to generate a synchronized show in master/slave mode. Its high-frequency LED dimming allows for flicker-free video operation, plus you can power link up to 8 units to save time running cables and extension cords.